This year one of my goals was to be healthier. I'm already generally a healthy person - I rarely eat junk food or sweets, never drink soda, I usually sleep at a reasonable hour, I workout but still... I wasn't feeling 100% so it was time to change things up. First - I decided to go vegetarian. I realized every time I ate meat, I just didn't feel good. I felt bloated and just felt too full even if I didn't eat much. I went vegetarian for a few weeks and pretty much instantly started feeling better. I think around week 5 I started to feel a bit tired all the time and introduced salmon into my diet. It's been a solid 4 months now and I don't have any cravings for red meat and overall feel much cleaner and not bloated. I also do my best not to eat anything greasy or very much process foods. That means no chips, crackers or anything of the sort. Just lots of veggies, fruits and grains. On the days that I am at the office, I always bring a little zipblock bag of peels mandarin oranges with me to snack on and for a burst of vitamin C.
Second - I also have been doing Juice from the Raw Cleanse. I think since eating a vegetarian diet and eating less, doing the cleanse was much easier since my body doesn't feel hungry all the time. I usually like to do a cleanse on a day after I ate a lot - which was definitely after my birthday weekend. 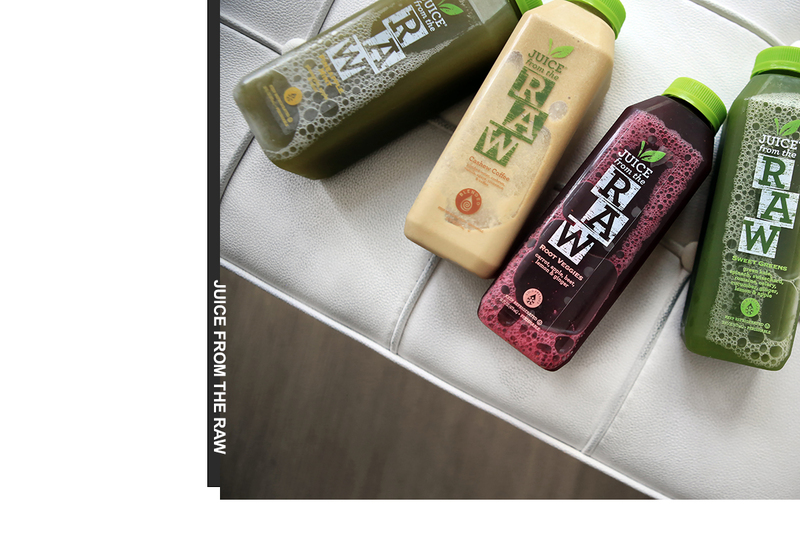 There's six juices for each day (3 days total) and each one is super tasty. Third - Part of being healthy is always making sure you drink enough water. It make sure that I do, I have these super cool glass water bottles from BKR. I keep them in filled up in the fridge ready to go at all times. Whenever I leave my place, I just grab one to-go! They are so perfect because they are glass so you don't get that weird smell from plastic. And anything spiked wins in my book. Fourth - And finally, my workout routine. So last year I had limited access to a gym so using a stationary bike and some weights was pretty much all I had along with a rather short window to get my workout in. Luckily just in time for healthy resolution, my apartment complex just opened a full gym. I get my workouts in 2-3 times a week - depending on how crazy things are that week. And in terms of the workout - I mix it up. I'll do cardio on the elliptical and then some yoga on some days or weights on others. I use the TRX bands for resistance and to increase intensity. I also like to mix in Kayla's workout (we all know Kayla! And if you don't you should check her out!) I try to make every workout slightly different to keep my muscles nice and confused - thats's always key! On the days I don't get a full workout in, I still try to jumprope for 10-15 minutes. To help me track all my activity - my Misfit tracker is everything! I link it to an app on my phone and it monitors when I'm active, reminds me by vibration when I haven't been active for a hour (usually this happens when I chain myself to my desk) and it even tracks your sleep. Apparently, I'm a very light sleeper! But knowing all this makes you accountable! 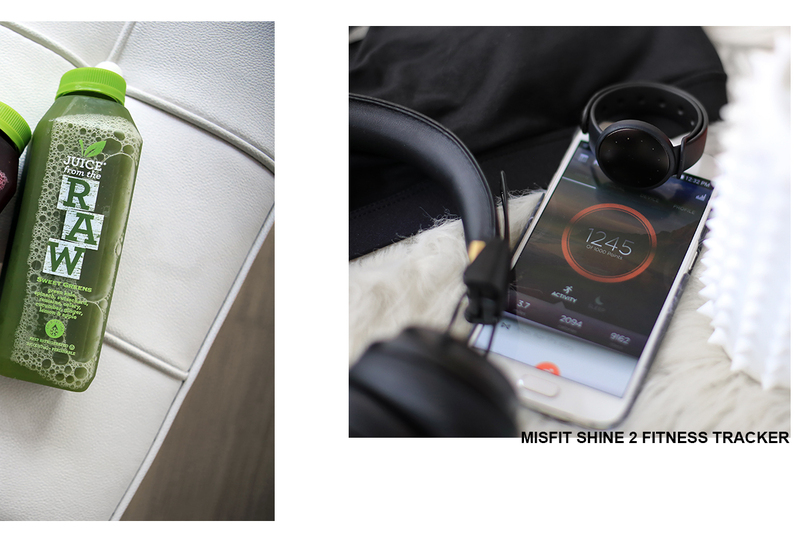 The Misfit shine tracker is definitely my favorite tracker that I've tried yet since it also notifies you by vibration and the lights on the face when you receive text messages or phone calls. And I actually like that my steps aren't displayed on the face but rather in the app. It makes me feel like it's more incorporated in my daily routine/life rather than just a goal you are trying to reach. After X number of days, I get bored of that. I appreciate the daily summaries from the app much more as it tells you exactly when you were active - Ex: Light activity at 1:26PM for 25 minutes. This keeps me much for active throughout the day! My workouts are also made better thanks to Ellie's workout subscription box! The $49 monthly box comes with 5 workout items usually including a new workout outfit of sports bra, leggings and top and some type of accessory and equipment. It's such a steal since workout clothes can be $49 a piece! I've been super obsessed with the leggings and sports bras I've received so far - they aren't your usual boring gym pieces. Overall, I am feeling much better this year between eating vegetarian and constantly mixing up my workouts. Can't wait to push myself even more! Update on May 17: Since starting this even healthier lifestyle, I've actually lost ten pounds!